Don’t judge a book by its cover. You heard it, right? While I try not to, I do ninety percent of the time. And it’s a subject thing, isn’t it? What one person finds attractive could be hideous to someone else. We all have preferences and opinions. How can one cover please everyone? It can’t. But that’s not the mystery. I stumbled upon a book. Just your average mystery book, I thought. Until I discovered the entire publication was a mystery within itself. The more I explored this book, the more befuddled I became. It shook me. You could have knocked me over with a well aimed jellybean. It led me to question not only covers, but if book blurbs even matter? And, do ratings count for nothing? So, let me tell you about this little book. By the time we’re done, you might be flinching at jellybeans too. It was an average day, an iced tea in one hand and my iPad in the other. I sometimes check the top charts, particularly iTunes since that’s my media preference. One of my books (Deadly Dancing. You should download it. It’s free!) 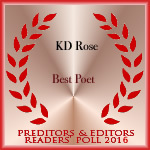 has been hovering in the Free Mystery/Thriller top chart for about six months now. I’ve watched as other books spike and fall. And yet, I linger at the bottom. Something I’m very thankful for. Now, you might be thinking, “This is a top chart for free books. It doesn’t mean anything.” Oh, but it does and there is a reason I’m heading down this winding path. I’m not just here to toot my own horn. The free charts are cluttered with new and old authors, even famous are starting to list free titles. Some authors pour big money to get into the ranks only to be gunned down by the next release fueled by thicker pockets. This particular mystery book has been hovering with me. Sometimes it shoots past me and sometimes it falls a bit behind. But we are still together, orbiting around one another. So, what is this author doing different to stay on the list? (Because I sure the heck don’t know what I’ve been doing.) So, I clicked on the book and found myself with more questions than answers. And here it is: Bound by Brittany Knight. Please review what I will call “Exhibit A. This is a snap shot of the iTunes listing. It’s an eye catching book cover, right? Simple and effective. And the more I look at it, the more I think the author made it herself. Why? The title font is too simple. Looks like Arial or something similar. And, the author’s name is tiny and blends in with the picture. Not something your average designer would do. But it works! I have no doubt this book has been downloaded purely by the cover. It makes me want to know more. Who is this person with their hands bound? Will they survive? Then, I notice the rating. Three stars. Not bad but we authors sometimes can be star hogs. We crave five stars and will tolerate four. But three is solid and good. I graciously accept three stars. And this author has 631 ratings. For comparison, I’ve been hovering with her and have 103. She’s beating the tar out of me. The date tells me this book has been around for nearly five years. Wow, this must be a great book, right? Not only is it in the top charts, has a gripping cover and a decent rating, but it’s been hanging around and people are still reading it. Mystery solved, right? This is where I introduce Exhibit B. Now is the time to guard yourself from jellybeans or other flying objects, dust included. Now, a one page book can still be great. But, it still made me stop and wonder. And did you read the book description? “A man who goes to an old manor that used to be in the family, while on a business trip who discovers secrets about the manor and its owner.” Okay, I’m not an editing or marketing genius, but I cringed when I read this blurb. Now, I’m not trying to slam this book. I’m trying to understand its success and Exhibit B wasn’t helping. So, off to the reviews I trot. And here comes . . . you guessed it. Exhibit C. Oh, my. Judging by the reviews, those who downloaded were as confused as I was. But what tossed me for a whirling loopity-loop is the bottom review. Is this right? 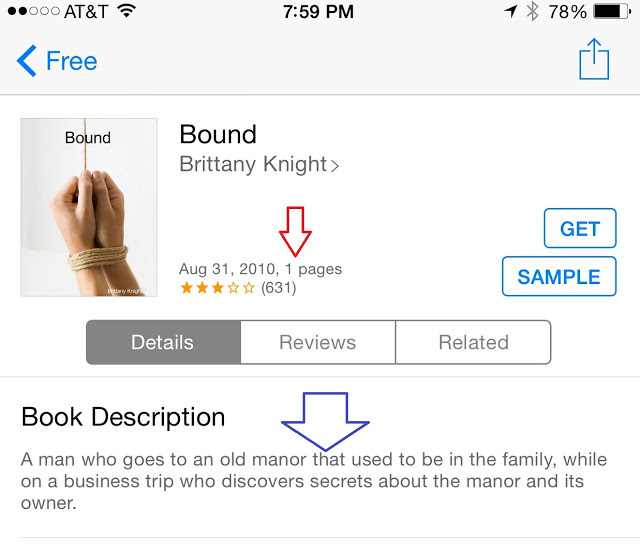 Did Brittany Knight review her own book and then only give herself one star? Then she defends the book, saying it was a draft and she was seeing how “the whole publishing thing worked.” I scratched my head. Judging by the review date, that was over four years ago. Wouldn’t the author take down the book if it was only a draft? Surely she’d want the world to judge her by her finished work, not a draft. Is it a hoax? Maybe there’s a marketing group or class tracking how many saps will download the work, ignoring the blurb and reviews, and to only focus on the cover. So, for the sake of this article and the mystery, I do it. I download the one page book. I would offer an Exhibit D, but I don’t want to tread on copyright laws (even though this book didn’t bother with a copyright statement). 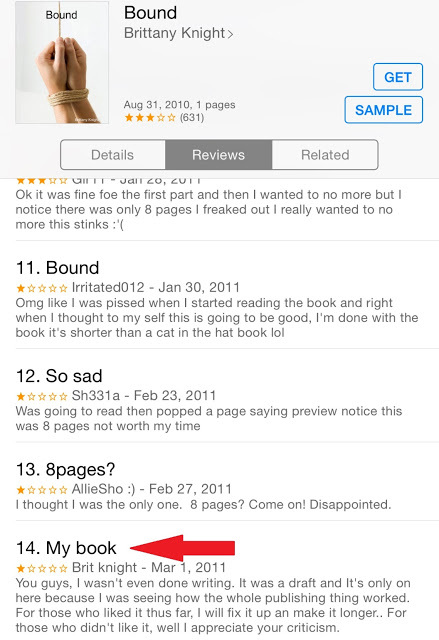 What I notice right away is that it states “Bound [Preview],” and that it’s only four pages on my reading device. Okay, so it might just be a draft after all and she’s giving me warning, though I still question why she hasn’t taken it down yet. And then I begin reading. Without being overly critical, it’s definitely written by a novice still working out the kinks. There are some nuggets like, “The rain slowly began to stop so suddenly, which I found strange.” Or, “Meluna Ludwell was my great-great-Grandmother’s mother who passed away in the 1700s, who left this manor to my great-great grandmother, who didn’t want it.” There is no ending. We are left stranded. But, hey, I’m still growing and learning. We are all novices in the beginning. Maybe Brittany has finished the book. Maybe there’s a better version out there and people are downloading the wrong version, causing the book to hover in the top charts. It’s possible, right? Without being a total cyber-stalker, I explore the internet, trying my hardest to solve this mystery. Alas, I can’t find a website or fan page. No additional books were published under that name. I now face a sobering reality: I’m competing with an abandoned book. My theory: A young Brittany most likely uploaded a draft, eager to dip her feet into the publishing world and then fled from stinging reviews. I hope she wasn’t veered off course by them. They are a jagged pill to swallow. Whether or not she knows it, she has done something remarkable. While most of us are clawing to get to the charts, her forgotten book still lives and breathes and is hanging on by its cover. She struck gold with that simple design and walked away before the payout. A little piece of me withered. There never was a mystery, was there? We all know you can’t judge a book by its cover and we also know that great covers drive book sales. The proof is here in an abandoned book. Nicolette Pierce is the author of the popular Nadia Wolf and Mars Cannon series, as well as upcoming books.